It wasn’t until about three questions into this interview that I realized I was talking to the wrong person. Swingin’ Utters singer Johnny “Peebucks” Bonnel was kindly answering a question about New Jersey or something when I realized he wasn’t one of the dudes from the Bouncing Souls. I quickly checked the email from the Fat Wreck Chords publicist and sure enough. I didn’t just misread the band’s name in the email, I’ve been conflating the Bouncing Souls and the Swingin’ Utters for 25 years. It’s not such a stretch. They were both popular with the Warped Tour circuit and the first half of both names end in a present participle. Not only did Bouncing Soul and Swingin’ Utters never exist independently in my consciousness, I would have a hard time distinguishing 80% of the music Epitaph Records and Fat Wreck Chords released in the 90’s. It’s what we called “mall punk” back in the day. Yes, I admit to having judged bands based on where I think their fans shopped. I later perused the Swingin Utters’ sizable catalog. I learned to appreciate them as much more than the ‘pop punk by numbers’ band I assumed them to be. Waltzy songs like “One in All” from “A Juvenile Product of the Working Class” and “Lampshade” from “Dead, Flowers, Bottles and Bluegrass and Bones,” the ‘Poguish’ romp “A Promise to Distinction” off of “Five Lessons Learned” andthe anthemic “Imitation of Silence” off their brand new “Peace and Love LP” prove them to be versatile songwriters. “[Peace and Love] has got a lot of different sounding tunes” Bonnel said. “I wrote four of the songs myself. It’s a little bit on the bizarre side but it’s got some songs that sound like early Utters too” I’m assuming Peace and Love is an ironic title since it seems to be one of their heavier offerings musically and lyrically their angriest. Track 11 is titled “Yes I Hope He Dies”. Johnny is now 51 with a straight job at a screen printing company and he’s married with two kids. This sedentation incubates normal songwriters into bland, passionless drips e.g. 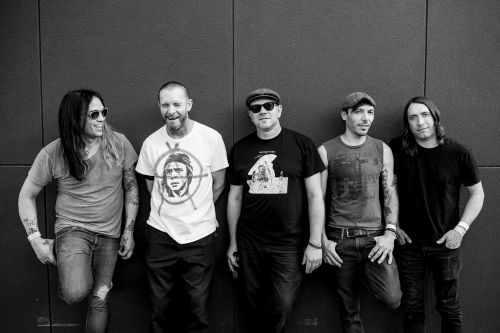 Billy Joel and Eric Clapton but the Swingin Utters may have just released their most inspired and thematically aggressive album in their 30 years of existence. I asked Johnny Bonnel how the name “Peebucks” came to be. He says “When I was really young I got super drunk and urinated in my pants. I later went to Taco Bell and paid for my food with the soiled dollar bills. My friends just called me Peebucks after that”. And for this reason alone, I invited Johnny Peebucks of the Swingin’ Utters to play “Taco Bell: Real or No Real” to which he gladly accepted. Kung Fu Jimmy: In this game all you have to do is decide if the menu item I give is currently or ever has been on Taco Bell menus somewhere in the world. KFJ: Number one is a hard shell burrito, which is a taco burrito combo called The Burraco™. KFJ: No, I’m sorry, that is a fake Taco Bell menu item. Number two is a beef and Cheeto burrito called….the Cheeto® Burrito™. Real or no real. KFJ: That’s right. The Cheeto® Burrito™ is real. You got one for two so far. Number three is a Tostitos shell taco called the Tostitos® Tacos Locos™. KFJ: No, Tostitos are just corn chips..
KFJ: It would just be a taco. KFJ: So, one out of three so far. Number five: A 7-layer Doritos shell taco called the 7-Layer Doritos® Tacos Locos Burrito™. KFJ: No. that one’s not real. It’d be hard to market. KFJ: That is actually real. KFJ: That one is also real. KFJ: No, those aren’t real. Johnny: God, I’m horrible at this. KFJ: No, Taco Bell’s real food seems too weird to be real..
KFJ: So you got 3 out of 9 which makes you a loser but sort of makes you a winner in a way. It was good talking to you, Johnny. Johnny: Yeah, good to talk to you too. Thanks.